Every time I think my custom made Parisian adventure has reached its high point, I come to the next stage of the project and it's even better and more exciting than the one before. Today, I watched as a simple sketch I had put down (and Ruty improved upon!) transformed before my eyes into the very first stage of a piece of clothing. It was so surreal. A part of me experienced it with child-like awe and sheer joy; I've had the silliest smile plastered on my face all day. And another part of me took it in with a more somber adult fascination and a genuine sense of respect for the process and for the artists I've met. It's been such a deeply rewarding experience for me on every level- intellectually, creatively, and emotionally. Come along! I'll share it with you. I arrived a few minutes early (a rarity worthy of note) to Ruty's atelier, and climbed a windy staircase to the 2nd floor where I met Fabrice, a talented wedding gown and evening wear designer who is also a technical expert in pattern making, cutting and sewing. Hanging all around us were thousands of Ruty's patterns, a subset of which you can see in the image above. A pattern is basically the 2-D version of a garment. It is what cutters use to guide them as they make the various components of a piece of clothing, like the sleeves or the bodice or the pant legs, ensuring those pieces are correctly-sized and symmetrical. A pattern comes in all the standard sizes, or you could have a custom pattern made as well. Ruty explained that she has a mental catalogue of every pattern she had made over her nearly 40 years as a fashion house. Here is the top part of my dress. This project literally has my name written all over it, right down to the pattern. We started first with the simpler of the two projects- the slip dress. 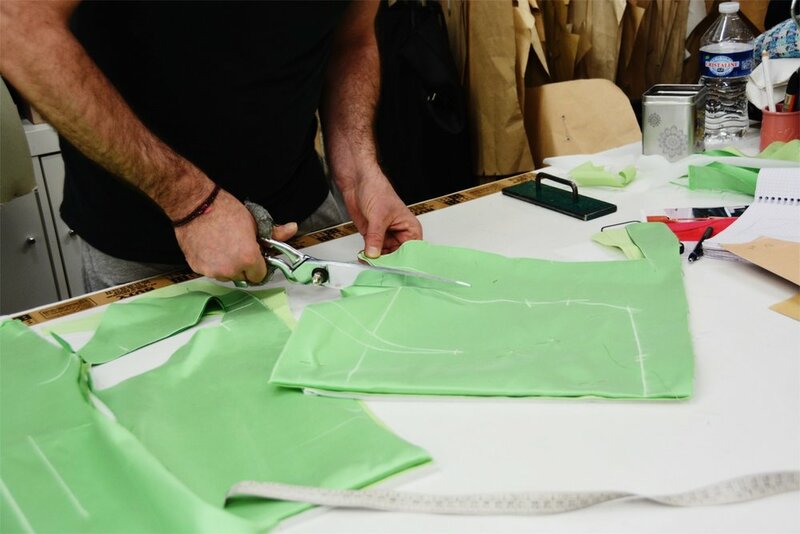 Ruty selected the patterns and read a series of measurements and some technical guidelines to Fabrice, who took some notes and then proceeded to meticulously lay the fabric down, trace the patterns, and cut. I asked him what his favorite part of his work is, to which he replied, "Everything." Also, hi Ruty! 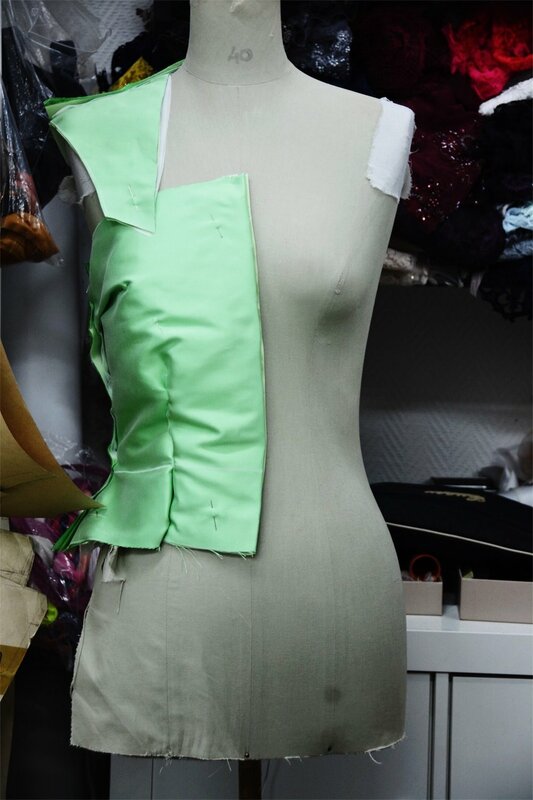 Next, it was on to the pièce de résistance, the mint-green silk top, which was more technically challenging because the bodice we decided on required more cutting. Also, in the second picture you'll notice the final piece will actually have three layers, because lining the bodice will give it more structure. Here, Fabrice took the flat pieces of the fabric he had just cut and started pinning them together to form the bodice so that I could see it. It felt like magic! It was magic! A man and his art! Here, he pins the asymmetric side bustle on the left and pins the slip dress on the right. Modifications to the collar or back or sleeves are considered less significant, and will be done after the garment has been sewn and fitted to me. And finally, he wrapped two neat packets containing all of the components of the garments heading off to the sewers on Thursday! Like going to a farm to learn how our food is grown out of soil and water and seeds, going to an atelier to see how designers, cutters, and sewers breathe life and dimension and volume into pieces of fabric is a profoundly connective experience. It took two seasoned professionals two hours of collective brainstorming and negotiating and creating to cut these garments. Which says nothing of the pure joy that each displays in their work. And the sincere dedication they possess to crafting a piece of clothing that is ultimately not only beautiful, but unique; it is a garment exactly suited to me- to my figure, to my wants, to the way I dream of wearing it. In our fast moving world, a world of mass production and quantity and anonymity, is there a greater luxury than someone taking the time and investing the energy to listen carefully to an idea you have and then helping you see it to fruition in order to produce something singularly unique to you? All the while thinking of how you move and how you'll wear it and how it will make you feel? Maybe it's residual magic from my experience today, but I really can't imagine anything more luxurious than that.